Application forms are available for download below, from Mr. Moonlight, or in the main office. The Esquimalt High Rugby Academy (EHRA) focusses on high caliber athletic participation, academic excellence and character development. The EHRA will provide a quality program that develops all athletes both physically and mentally to create active and well-rounded citizens. We will make an exceptional effort to include all athletes who want to be part of this program. By providing a supportive and challenging environment with the help from Rugby Canada’s elite athletes, the EHRA will help all athletes to achieve their full potential. 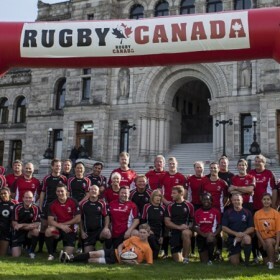 In September 2012, members of our community approached the school administration about the feasibility of starting a rugby academy at Esquimalt High School. The approach was founded on the basis that although there is significant interest among youth for the sport of rugby, there are relatively limited opportunities for involvement in the sport in Victoria in comparison to other sports offered at the community level. This is particularly true for girls, as the community club system focuses primarily on boys. The pursuit of athletic excellence serves to promote physical literacy and provide for a healthy active lifestyle, lifelong learning, and the skills and knowledge necessary to motivate students to be self-directed. Esquimalt High School’s Rugby Academy creates an appreciation for the personal benefits of high level training and physical fitness. It is paramount that students learn the principles of training and the specific methodologies that suit their individual development and needs to promote a lifetime of fitness. Although the game of Rugby is used as the primary mode to deliver all aspects and outcomes, the skills learned in the EHRA will be transferable to many life skills. As the format of the Academy program will require that the students are scheduled into only one block in the timetable each semester, Academy students will be able to access specialized programs based on their educational goals. Students will be grouped according to grade level, skill level and gender for skills and tactics involving contact. All skills will be taught with appropriate progressions with an emphasis on safety and proper technique. The result will produce very skilled, technical, safety-conscious athletes. Personal character development, development of excellent work ethic, teamwork, goal setting, increased awareness of social responsibility, and community service are interwoven through all four years of the program. In the case of over-subscription, admission will be based on the strength of the application and a wait-list will be established. Teacher references may be contacted and students may be interviewed. Upon acceptance to the program, students must adhere to the code of conduct form submitted with application. The Academy coordinator and school principal will contact applicants and families. The goal of this meeting will be to go over codes of conduct and general expectations of the program, assess the suitability of the student, and answer any questions, to support a smooth transition into the program. Academy staff will select applicants based on evidence of understanding of program goals, academic readiness, and motivation to commit to program. There needs to be 26-30 successful applicants for the program to be established. Students will come to school for transition meetings with staff and receive timetables for the following school year. Athletes will receive tours of the school and facilities at this time. The day-to-day functioning of the Academy is the responsibility of the program coordinator, Mr. Moonlight. Rugby Canada players and coaches with high levels of experience will form the coaching staff. The Esquimalt High Rugby Academy administrators will use Regulation 6145.02 as a guideline to ensure all community coaches meet or exceed district expectations. All coaches will be required to submit to a criminal record check and to sign the Coach’s Code of Conduct (Appendix 7) in addition to the Community Coach Application Form and the Community Coach Commitment Form associated with Regulation 6145.02. The school’s existing facilities will be used: school field, gymnasium, weight room, and class room. There is also a possibility of using local community parks such as Bullen Park. Some additional training may be done using local all-weather fields. Academy students will receive outstanding instruction that will provide them with the rugby skills to compete at the highest level of their potential. The EHRA will foster personal character development, excellent work ethic, teamwork, and goal setting skills in the students who enroll in the program. These students will demonstrate increased awareness of social responsibility, self-esteem, and connectedness to both school and community.